You spend your childhood overseas, the son of Southern Baptist missionary parents whose posts are mainly in southeast Asia. You, too, hear the call of God, but in a very different form, so convert to Russian Orthodox and attend St. Vladimir’s Orthodox Theological Seminary. After ordination, your first parish assignment is Menlo Park at the Nativity of the Holy Virgin Church, housed in a local historical building. “I did a lot of reading and came to feel that it was important to have a greater connection with the historical church,” explains the Rev. Fr. Hermogen Holste, standing in the recently expanded church building. 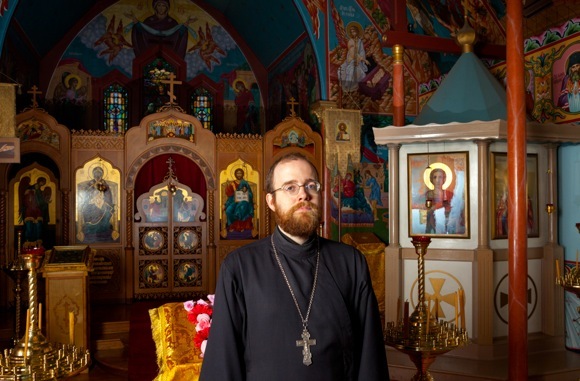 “Based on what I learned, I believe the Eastern Christian churches have preserved certain things better. The parish recently celebrated two milestones, its 60th anniversary and the completion of a three-year renovation of the church building, including expanded floor space and the addition of a choir loft. With that project completed, Fr. Holste is hoping to increase resources for continuing education and to establish a book store with both English and Russian titles.